The climate is mild with an average annual temperature of about 16ºC/61ºF. When new JETs arrive in the summer, it is typically very hot. Daytime temperatures will reach 35-37ºC/95-98ºF with humidity around 70%. High temperatures combined with high humidity make it difficult to find relief, especially considering many Japanese schools make light use of air conditioning. Those who are inexperienced with this type of climate will probably be surprised, and it will take some time to get used to it. Pack light clothing and carry around a small towel/handkerchief to keep the sweat at bay. You can turn your apartment into a space for relief from the heat by purchasing a fan and using your air conditioning/dehumidifier (but remember to turn it off when you go out!). 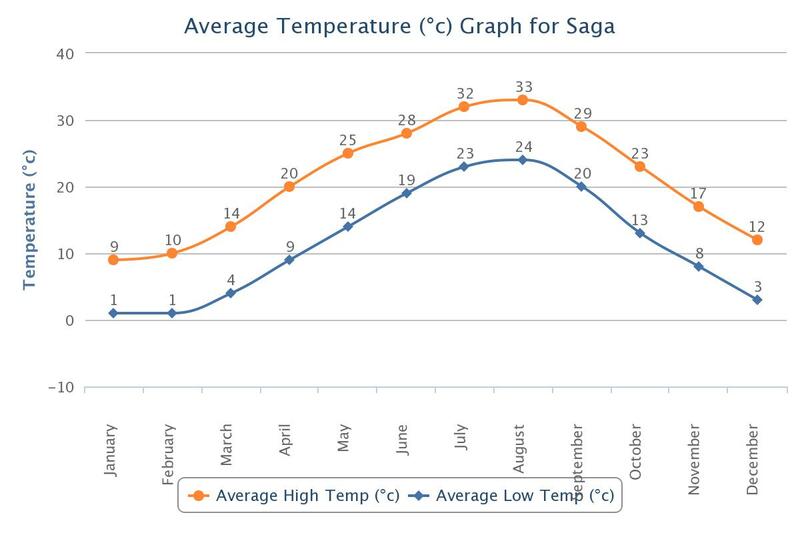 The hot season starts in May/June and lasts through to late September/October. 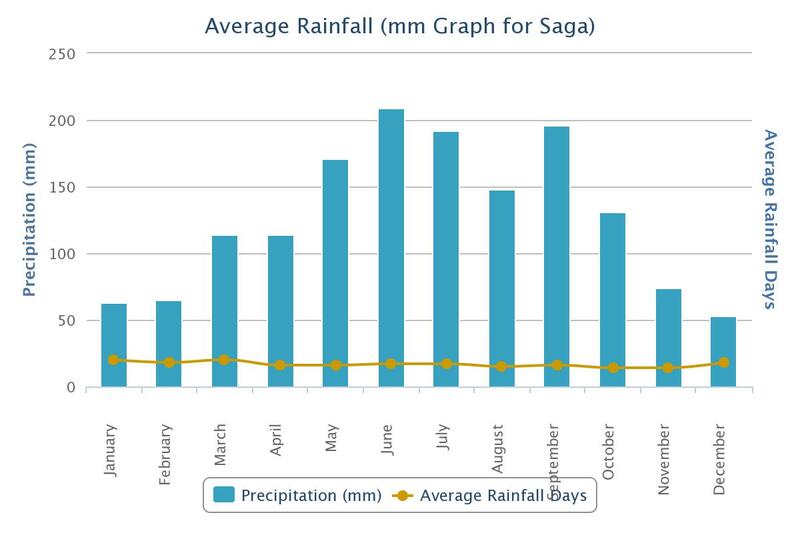 June is also the rainy season in Saga Prefecture with plenty of rain over a 2-3 week period. Luckily you will have just missed this by the time you arrive! That being said, there are obviously rainy days in other seasons too, especially in spring. You will most likely need some rain gear, (e.g. rain boots, rain coat, umbrella), especially if you have to bike or walk to your school. All of these items can be easily procured in Japan once you arrive. In September we generally get a few typhoons close to Kyushu, although these have never been so severe that schools have been cancelled and are not a cause for concern. Autumn is a transitional season as the storms taper off and the cold weather begins. After a hot summer it is certainly a welcome change; be ready with light jackets for any outdoor events and maybe some layering. The leaves will be begin to change color and there are many beautiful photo opportunities around the Prefecture. From late November/December until February/early March, it is cold. It’s not usually below freezing but with no central heating in apartments and schools, it will feel colder than it is. Stock up with coats, layers, heavy blankets, heat packs, and floor heaters. Your apartment may also have a kotatsu, a type of table with a heating element on the underside. Saga Prefecture experiences very little snow that only very occasionally affects schools in mountainous areas. Drivers in our prefecture do not typically need snow tires, unless you plan to head to a ski-field area on a regular basis. From late March to May the weather starts to warm up again – another welcome respite between the extremes. With the warmer weather comes cherry-blossom season and plenty of opportunities to get out and enjoy nature before it becomes too hot. The Japanese people are very proud of their four distinct seasons throughout the year. The weather may seem tough at first but once you start settling into your new lifestyle you will find that you will become accustomed to it. Please try to dress appropriately for work but take care of yourself – layers in the winter and short sleeves in the summer are usually quite acceptable, but ask your teachers about what you can or can’t wear if you are unsure. Do note that schools and some offices are very energy-conscious and, as such, you may find that only certain rooms are heated. That said, don’t be surprised if classrooms and even the teacher’s room don’t have any heating/cooling. Since Saga Prefecture is a rural area, at certain times of the year when the wheat/barley or rice is harvested there is a lot of burning off in the rice paddies, and the resultant smoke can affect some people. In addition, plants here are different and some people find they get some hay fever, even if they didn’t back home. Finally, some days there are high levels of pollution from China due to air currents. You can purchase and wear a mask if you are sensitive to the pollution. If you’re often traveling between schools and home, it pays to keep an eye on the sometimes unpredictable weather. Japan Meteorological Agency’s rain radar is very useful. Saga Prefecture is a seismically calm area and you will not likely be in any danger here. We suffered no damage and in fact felt nothing from the Tohoku earthquake in 2011 or the subsequent tsunami. However, it never hurts to be well-informed about what to do in the event of a disaster, and even to prepare for such an eventuality. You can read more about disaster preparedness here.